The first fan I saw go down. 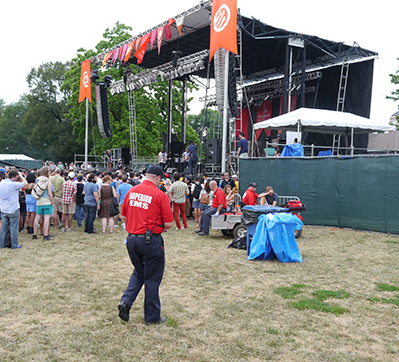 Following an intense, but brief thunderstorm the Pitchfork Music Festival opened their gates about a half hour behind schedule. The air was thick and humid as soaked fans trickled into the grounds. 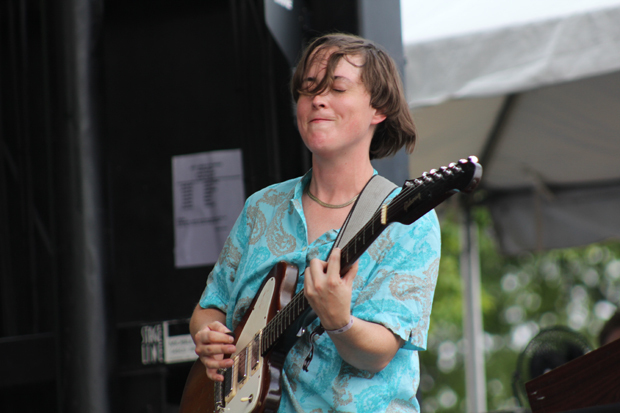 They were greeted by washes of guitar feedback from Lower Dens, the current project of Jana Hunter, a Baltimore-based Texan who has a long musical resume already. Over two albums Hunter has transitioned from a card-carrying "freak folk" (remember that?) to something more like moody kraut-rock. Today, however, it took a few songs for the motorik beat to get revved up. No matter, though- as the park began to dry out the crowd couldn&apos;t handle much more than the slow feedback drones Lower Dens delivered for their first few songs. Only a few songs into the set I witnessed my first causalty of the fest- a girl fainted and was carted off by medics. As they worked their way up to the catchy single "Brains," I thought they&apos;d perfectly sequenced their set. The driving, repetitive beat with short bursts of melody slowly turned thoughts from searching for dry ground to enjoying music. As evidenced, going into "rock mode" too quickly can be dangerous. Unfortunately soon the slower noodly songs returned and much of the crowd lost interest. At least they were safe, though. 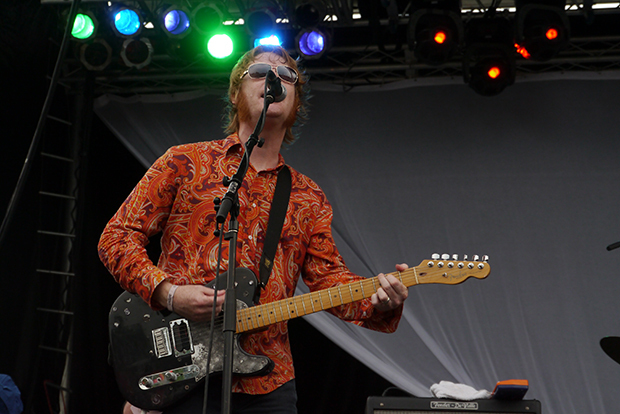 Where Lower Dens focused on steady rhythms, drawn out melodies and restraint, Elephant Six OGs Olivia Tremor Control were all about tempo shifts, lots of melody and slightly overreaching ambition. 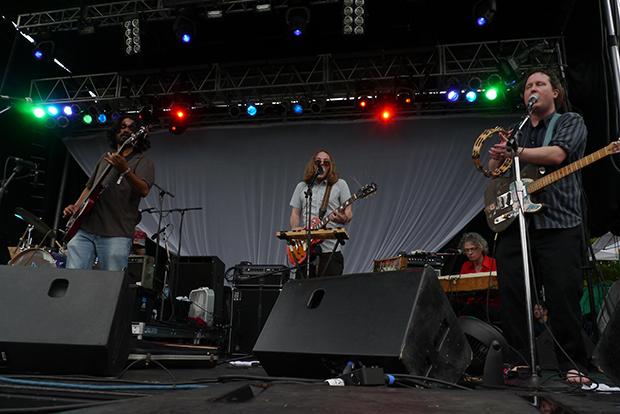 Founding members Bill Doss and Will Cullen Hart traded lead vocal turns, while their compatriots brought clarinet, violen and an assortment of horns into the mix. It was a nice shot of energy after being teased by the middle of Lower Dens&apos; set, though still not too energetic for early in the day. The crowd seemed to be receptive, with a surprising amount of singing along from very young fans in the front. The songs&apos; abrupt shifts and crammed-in melodic ideas (that can sometimes come off as annoying on record) actually served to keep things fresh and exciting. Even places where the vocals had pitch problems or the instrumentation sounded muddled, it all added up to a celebration of humanity (and the imperfection inherent to it). As they closed their set with "The Opera House" singing "you make the choice" over and over again the possibilities of life felt expansive.